I wrote a USL Pro Spotlight earlier in the season showcasing all of the fantastic Soccer Specific Stadiums in USL Pro. 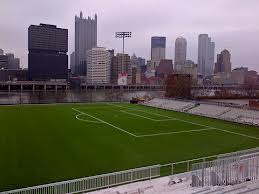 One of those stadiums in the article was the shiny new home of the Pittsburgh Riverhounds, Highmark Stadium. Despite opening a top notch facility with one of the best Downtown skylines in North America and hosting the defending FA Cup Winners, Wigan Athletic, the Riverhounds have struggled to find success in USL Pro. The Riverhounds currently find themselves in 9th place of the USL Pro table and one spot out of the USL Pro Playoff picture. They have only accrued 28 points from 20 games played, however, a couple of results this weekend and they can pull themselves into serious contention for that final play-off spot. The difficult part is that they will have to get these results on the road, something that many USL Pro teams struggle with. As a league all USL Pro teams have a combined record of, 33-72-36* on the road. Pittsburgh themselves have a 2-3-3 record on the road. The next 9 days will either make or break the Riverhounds post season chances as they will have 3 of their final 6 matches and will face crucial opponents. First up for the Riverhounds is VSI Tampa tonight at 7:30 PM Eastern. VSI Tampa Bay currently occupies the 8th and final playoff spot with 31 points from 20 games.Earning points from VSI Tampa Bay at Plant City Stadium hasn't exactly come easy for visitors. VSI have amassed a 7-2-2 record at home and have only allowed 12 goals from 11 total home games, so it is safe to say the Riverhounds will have a tough task at hand. However, a win tonight could bring the Riverhounds level with VSI Tampa Bay on points but ahead of them via the Tie-Breaker Rule (Head to Head record is 1st one Tie-Breaker list). Even a draw would go a long way in keeping the Riverhounds within striking distance and possibly leap-frogging VSI Tampa Bay next weekend when the two face off yet again. 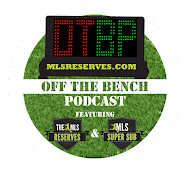 Sandwiched in between these two clashes is a road trip to the always volatile and unfriendly confines of the Citrus Bowl to face USL Pro giants, Orlando City SC. Orlando City currently finds themselves in 2nd place in the league with 42 points. 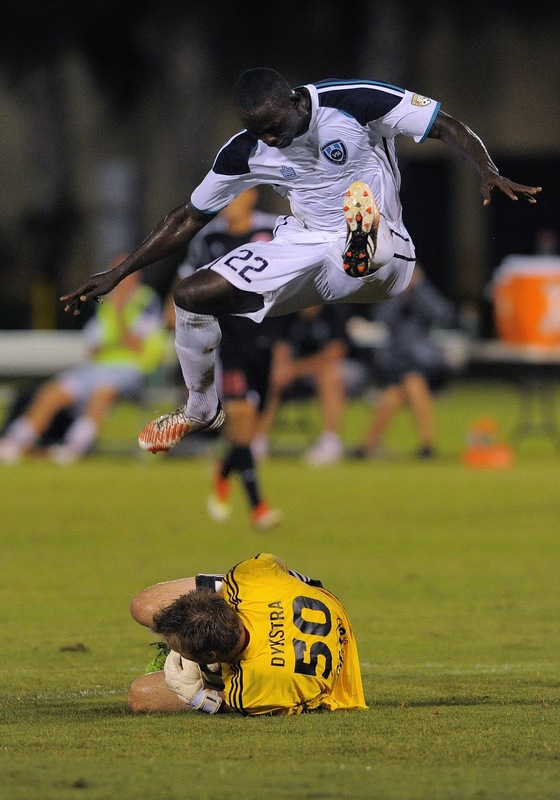 To make matters worse for the Hounds, Orlando City has received CJ Sapong on loan from Sporting KC in hopes of replacing some goals left unfilled by Jamie Watson who has suffered a calf injury and will be out another 3 weeks. Although, the road ahead for the Riverhounds won’t be easy, they have a great opportunity to put their post-season hopes in their hands and force their way back into the play-off picture. This is the time of the year where you can erase the earlier struggles of the seasons and get a fresh start and make sure you are still lacing up those cleats come August 24 or 25 instead of golf shoes. The post-season starts now for Pittsburgh. Note: The 72 losses include Antigua Barracudas' 23 losses so far this season. Antigua has had to play all 23 of their games on the road this year and have yet to earn a point in the league. Thanks for this. Join the world of cool math game and try trashing those nonsense , waste games from your phone and get this cool math game junction which is free for all the android users and you can also tell your friends and kids to try this game as this games are great work out for mind . I love all news connected with sport even if they are bad for my favorite teams. As for me I'm playing soccer in the team of my essay writing company and I'm waiting for every game and training. This is my favorite sport game.